Four U.S. service members were killed Monday in an ambush in the Sunni Muslim city of Ramadi, witnesses said. Videotape delivered to Associated Press Television News showed the four, still in uniform, lying dead near what appeared to be a walled compound. U.S. command in Ramadi said four Marines were killed in an ambush in the last 24 hours, but was unable to confirm that the bodies shown in the videotape are those of the dead Marines, reports CBS News Correspondent Charles D'Agata. Elsewhere, a roadside bomb exploded near the northern city of Mosul, killing four Iraqis and wounding four others. The military said the Iraqis were employed by a private company working in northern Iraq, though it didn't say which one. On Sunday, attackers lying in wait for Iraqi troops detonated a roadside bomb on the dangerous road leading to Baghdad's airport Sunday, killing two Iraqi soldiers and wounding 11. 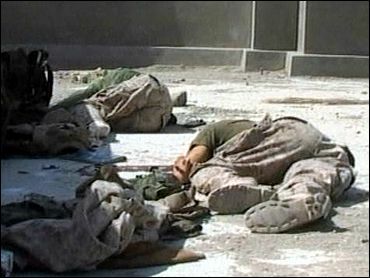 American troops took the Iraqi wounded to a U.S. aid station and waited while they were treated. A mortar round also injured six police and four Iraqis in a separate attack Sunday near the Iraqi central bank in Baghdad. An American Marine was killed in a non-combat incident Saturday in Anbar province, which includes Ramadi and Fallujah, the U.S. military said Monday. Meanwhile, a video delivered by terrorists to Arab television threatened to behead a South Korean worker kidnapped in Iraq, and a report surfaced that the same kidnappers may be holding as many as 10 other foreigners captive. Brig. Gen. Mark Kimmitt says a U.S. airstrike in Fallujah over the weekend killed key figures in Abu Musab al-Zarqawi network. The strike, in which at least 16 died, had been a source of controversy. In the videotape aired Sunday on the Arab satellite TV network Al-Jazeera, the kidnappers identify themselves as belonging to a group led by Zarqawi, a Jordanian-born terrorist who is linked to al Qaeda. In the tape he screams in English, flailing his arms: "Please, get out of here," apparently referring to South Korean troops in Iraq, "I don't want to die. I don't want to die. I know that your life is important, but my life is important." Yonhap news agency reports that the other foreign captives include a European journalist and "third country" employees for the U.S.-based contractor Kellogg Brown and Root. Sun-il also worked for a contractor.